Vicksburg  is a city in Warren County, Mississippi, United States. It is located 234 miles (377 km) northwest of New Orleans on the Mississippi and Yazoo rivers, and 40 miles (65 km) due west of Jackson, the state capital. Vicksburg is considered a cultural landmark in the American South and is home to the Southern Cultural Heritage Center, Vicksburg Military Park, and (opening soon) the Lower Mississippi River Museum. The area which is now Vicksburg was previously part of the Natchez Native Americans' territory. The first Europeans who settled the area were French colonists, who built Fort-Saint-Pierre in 1719 on the high bluffs overlooking the Yazoo River at present-day Redwood. In 1790 the Spanish founded a military outpost on the site, which they called Fort Nogales (nogales meaning "walnut trees"). When the Americans took possession in 1798, they changed the name to Walnut Hills. A sprawling community developed which officially incorporated in 1825 as Vicksburg. It was named after Newitt Vick, a Methodist minister. Vicksburg experienced rapid growth during the expansion of the cotton trade in the American South. Cotton was grown most profitably in the Mississippi Delta region. Vicksburg sits at the southern most tip of the Mississippi Delta, and served as a production and commerce hub for the cotton industry. In the decades leading up to the American Civil War, Vicksburg became very affluent from the large number of Delta planters and merchants making considerable profits selling cotton to European and North American textile producers. Vicksburg is most famous as the location of a 47 day siege during the American Civil War (May 18 – July 4, 1863). After federal naval forces on the Mississippi River made several attempts at passing the rebel batteries at Vicksburg, Ulysses S. Grant led the federal army on a campaign to put the Confederate garrison at Vicksburg to siege. The people of Vicksburg dug caves into the hillsides to survive the bombardment. The legacy of the siege lives through much of Vicksburg's art, museum exhibits and traditions. Vicksburg was instrumental in the growth and propagation of American Blues music-- which is native to Mississippi. Blues evolved primarily in the Mississippi Delta region from the musical traditions of African-American slaves before the American Civil War. Vicksburg served as a central hub for musicians to perform for merchants and travelers in the music halls and "juke joints" near the river port at Vicksburg. Today Vicksburg remains distinct as a place where travelers can experience the legacy and traditions of the American South in a quaint city overlooking the Mississippi River. The people of Vicksburg are very hospitable and love to pass down stories from generations past that will bring history to life. The pace of life remains much slower than in many other places in the United States. There are many activities in Vicksburg from cultural and historical venues, as well as historic Washington Street full of restaurants and consignment shops of antiques. Be sure to get out of the car and explore - Vicksburg has beautiful architecture and a warm, friendly environment for walking. The closest commercial airport to Vicksburg is Jackson-Evers International Airport  in Jackson, about 50 miles east on I-20 (or a little more than 85 kilometers). Vicksburg also has its own municipal airport for general aviation. The Great American Steamboat Company of Memphis TN, offers riverboat tours that originate in New Orleans and end at either Memphis or St. Louis. Vicksburg is one of the port cities which stops are made en route between New Orleans and Memphis. Greyhound Bus Lines (or Delta Bus Lines) has an active (albeit a very small) bus depot just off of I-20 on the Frontage Road (1295 S Frontage Rd), on the Halls Ferry Road exit south bound. You can contact the depot at (601) 638-8389. Visitors can walk around the downtown area easily. Other sites away from downtown will likely require some other form of transportation. The city of Vicksburg does have a local bus service called the NRoute, and there are nine routes throughout the city. The hours of operation are 6 AM till 6 PM Monday through Friday. The main depot where bus passes may be purchased is located at NROUTE Office 2501 Halls Ferry Rd, and may be contacted by calling, Phone: 601-636-1053. Bus riding rules are fairly strict (no food or drink may be consumed while riding, and exact change is required). Bus fares are: $1.50 (transfers are not included in the one-way base fare), Senior Citizen $0.75, Children (ages 3 - 12) $0.50, bus transfer are $0.25 each, and monthly passes are $30. Be aware that bus transfers are only made at the main bus depot. 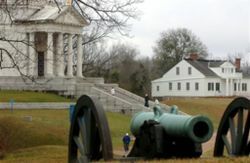 Vicksburg National Military Park, 3201 Clay Street, Phone: 601-636-0583, . Commemorates the 1863 battle and siege of the city during the Civil War. The park includes a visitor center, an impressive collection of monuments along the 16-mile tour route, and the USS Cairo, a salvaged ironclad gunboat. Allow at least half day (2-4 hours bare minimum) to tour the park by car, and longer by bicycle. $8 per vehicle entrance fee, good for one week after the date of purchase. The park is open daily, but closed on the following national holidays: New Years (January 1), Thanksgiving Day (the last Thursday of November), and Christmas Day (December 25). Casinos - Ameristar, Riverwalk, and Lady Luck. Bottleneck Blues Bar, Ameristar Casino, 4116 Washington Street, Phone: 601-638-1000 . This is about as close as it comes to a blues bar in Vicksburg (without hopelessly searching for a juke-joint in the Marcus Bottom area). Patrons must be 21 years old to enter (as you have to enter the casino) and have valid ID (a US driver's license or a passport for foreign nationals). Oddly, smoking is permitted during non-ticketed events, but prohibited during ticketed events. Most events are free, but occasionally you'll have to purchase tickets to some of the big name events. WestSide Theater Foundation - for information about upcoming plays, view their page on Facebook or call Jack Burns at 601-618-9349. Gold In The Hills at the Parkside Playhouse, Phone: 601-636-0471, . In its 70th season, it is the longest running melodrama in the world. Spring/summer only. $10 adults and $5 children. Riverfest held in downtown Vicksburg in mid-April, part music festival, part arts & crafts show. Historic Downtown Vicksburg, Washington Street I-20 Exit 4B or Exit 1A, Phone: 601-634-4527. Whether your interests lies in touring museums and attractions, taking a carriage ride or riverboat ride, antiquing, shopping, gaming or dining, Downtown Vicksburg meets your every need. The downtown businesses are known for their hospitality. They offer a unique blend of prompt, friendly and courteous service which makes your experience all the more enjoyable. Vicksburg Mall, 3505 Pemberton Boulevard, Phone: 601-634-0823, . Outlets At Vicksburg, 4000 South Frontage Road, Phone: 601-636-7434, . The Belle Boutique, 508 Klein Street, Phone: 601-634-0737, . Located on the beautiful grounds of Ahern's Belle of the Bends Bed and Breakfast and Tour Home. For gifts that are Unique and gifts that are Antiques. Walnut Hills, 1214 Adams Street, Phone: 601-638-4910, . Known for its round table service at lunch time: southern home style food served on a lazy-susan, $11. Goldie's Trail BBQ, 4127 Washington Street, Phone: 601-636-9839. Goldie's famous true pit barbecue and "down-home" atmosphere are widely known. Goldie's has been featured in Southern Living Magazine, Southern Magazine and the book Real BBQ. $3-$12. Rusty's Riverfront Grill, 901 Washington Street, Phone: 601-638-2030. Casual dining at its best. Located in historic downtown Vicksburg. Daily lunch and dinner specials. $6-$25. El Sombrero, 1820 South Frontage Road, Phone: 601-638-1388. Authentic Mexican cuisine. The Biedenharn Museum (see above) showcases an old-fashioned soda fountain, complete with authentic fountain drinks including all the Coke you can drink. Be aware that Vicksburg does have what are called "local option" laws pertaining to the consumption and sale of alcohol. Beer and light wines are not sold between 2:00 a.m. and 7:00 a.m. on Monday through Saturday, and between the hours of 2:00 a.m. and 12:00 p.m.(Noon) on Sunday. Also be aware that it is illegal to consume alcohol in an open container outside of a bar / casino. Penalties for public consumption violations can be as severe as a fine of $1000 and/or 90 days in the city jail. Ahern's Belle of the Bends (1876), 508 Klein Street. Phone: 601-634-0737 or 800-844-2308, . Majestic postbellum home in Vicksburg's historic Garden District. All rooms are located inside the home, are individually climate controlled, and include beautiful antique furnishings. The home is equipped with high-speed wireless internet. Also included are a full gourmet breakfast and historic tour. Ask about our romantic packages! Anchuca Historic Mansion & Inn (circa 1830), 1010 First East Street, 601-661-0111 Toll Free: 888-686-0111, . Stately live Oaks surround this magnificently furnished antebellum home, completed in 1847, it represents the first columned mansion built in Vicksburg. Located in the heart of Vicksburg's Historic District. Cedar Grove Mansion Inn, 2200 Oak Street, (601) 636-1000 Toll Free:(800) 862-1300, . Elegant rooms furnished in period and reproduction antiques, pool, on-site restaurant and bar, river views, turn down service, tour of the historic mansion. Stained Glass Manor (1902-1908), 2430 Drummond Street, 601-638-8893 Toll Free: 800-771-8893, . Includes tour and "New Orleans" breakfast. Sumptuous rooms furnished in period-style antique pieces, enhanced by a grand staircase. Be aware when hiking into the wooded areas of Vicksburg, that you may encounter a black bear (the proper description is the Louisiana Black Bear). Bear sighting typically increase during June and July (breeding season), and have recently have been spotted north in the forests of the cities of Redwood and Steele Bayou. If you do see a bear or its cubs while in the woods, you are much too close to the bears, and need to carefully but quickly, backtrack from where you came. Black bears are typically not as aggressive as the grizzly bears, but attacks on humans have been known to occur. Care should be taken when participating in water sports (i.e., boating) in the Mississippi River. The currents are very strong, large barges traveling up and down the river generate strong wakes, the water is tan-brown (so you can’t see if you’re about to hit something floating just beneath the surface of the river), poisonous snakes (vipers commonly called a “water moccasin”) are a concern, and occasionally an alligator might be lurking in the water. Swimming in or across the river is a very foolish thing to consider, and you’ll rarely see any sane person even attempting this feat. There are some areas of the city you wouldn't want to stroll alone at night, and should use the same level of caution and street smarts (your wits) you would use in any large city. The gas station on Clay Street and Cherry Street is frequently a site of petty crime. The largest hospital in Vicksburg is the River Region Medical Center (1-601-883-5000). It is a modern full-care center, and is equipped to handle nearly most major medical problems and emergencies. As with any hospital stay in the USA, be sure that you are adequately insured (or expect a very large bill for services which can easily cost into the tens of thousands of dollars for serious medical treatment in an emergency room) as there is not a national health care system. Be aware that humidity and the summer heat can be very intense. Be sure to hydrate yourself with either sports drinks or water (consumption of alcohol is not recommended regardless of what some may otherwise claim). Mosquitoes along the riverfront can be annoying during the warmer months. Be sure to wear repellents that have a high concentration of DEET to reduce the risk of mosquito transmitted diseases. Percentages of 25% or more DEET is recommended to repel most of the insects. 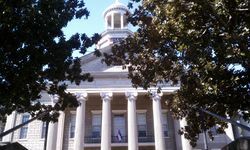 Jackson - You can find the Historic State Capitol building here, as well as the Russell C. Davis Planetarium, and the Jackson Zoo. Natchez Trace Parkway - This 444 mile long parkway is located a few miles east of town and traces an old trade route that has been in use since pre-colonial times. This page was last edited on 19 July 2018, at 08:15.